Hawkins, A. J. S., Pascoe, P. L., Parry, H., Brinsley, M., Cacciatore, F., Black, K. D., Fang, J. G, Jiao, H., McGonigle, C., Moore, H., O’Boyle, N. T., O'Carroll, T., O’Loan, B. Service, M., Smaal, A. C., Yan, X., Zhang, J. H., Zhang, X. L., Zhu, M. Y. (2013 a). 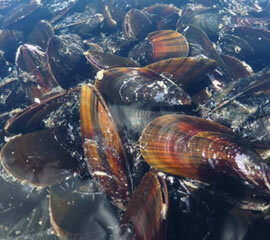 Comparative feeding upon chlorophyll-rich versus remaining organic matter in bivalve shellfish. Journal of Shellfish Research, in press. Hawkins, A. J. S., Pascoe, P. L., Parry, H., Brinsley, M., Black, K. D., McGonigle, C., Moore, H., Newell, C. R., O’Boyle, N. T., O'Carroll, T., O’Loan, B. Service, M., Smaal, A. C., Zhang, X. L., Zhu, M. Y. (2013 b). ShellSIM: a generic model of growth and environmental effects validated across contrasting habitats in bivalve shellfish. Journal of Shellfish Research, 32 (2): 237-253. Newell, C. R., Davis, C., Hawkins, A. J. S., Richardson, J., Getchis, T., Morris, K., Cheney, D. (2012 a) ShellGIS – a new GIS tool for oyster farm site selection, oyster growth simulation and production carrying capacity. Journal of Shellfish Research, 31(1): 327-327 (Abstract). Newell, C. R., Hawkins, A. J. S., Morris, K., Richardson, J., Davis, C., Getchis, T. (2012 b). ShellGIS: a GIS software tool for predicting the growth and environmental impacts of oysters as a function of site selection. p. 462, Book of Abstracts, Prague, 1-5 September 2012. World Aquaculture Society, Louisiana State University, Baton Rouge, United States of America. 1227 pp. Newell, C. R., Hawkins, A. J. S., Morris, K., Richardson, J., Davis, C., Getchis, T. (2013). ShellGIS: a dynamic tool for shellfish farm site selection. World Aquaculture, 44 (3): 52-55. Warren, I. R., Bach, H. K. (1992). MIKE 21: a modelling system for estuaries, coastal waters and seas. Environmental Software 7:229-240.